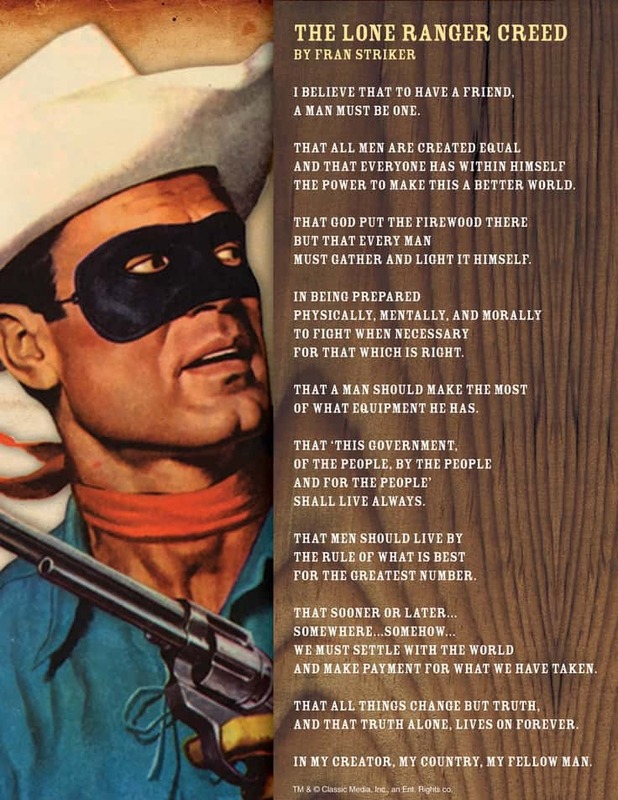 Clayton Moore signed off the interview with the famous Lone Ranger Creed — written by Fran Striker. It’s a true today as it was 70 years ago. He died in 1999 at the age of 85. …that to have a friend, a man must be one. …that all men are created equal and that everyone has within himself the power to make this a better world. …that God put the firewood there, but that every man must gather and light it himself. …in being prepared physically, mentally, and morally to fight when necessary for that which is right. …that a man should make the most of what equipment he has. …that this “government of the people, by the people, and for the people” shall live always. …that men should live by the rule of what is best for the greatest number. …that sooner or later…somewhere…somehow…we must settle with the world and make payment for what we have taken. …that all things change but truth, and that truth alone, lives on forever. …in my Creator, my country, my fellow man.